My original memory of D.A.R.Y.L. was actually reading the novelization – I don’t think I saw the film for years after that. 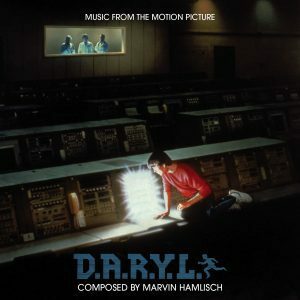 One of the movie’s memorable aspects was the thematic score by Marvin Hamlisch, culminating in the Teddy Pendergrass song, “Back Where I Belong”. Flash forward to 2013, and we’re finally going to be putting out an album for the film. Working on D.A.R.Y.L. was smooth sailing – everything was sourced from the original stereo 1/4″ reels, and we even had a pristine source of the song. There was a point early on (before we transferred the material) where we were debating pairing D.A.R.Y.L. with another film, in case it was so short. Fortunately there was just over 45-minutes of material which made it worth having its own album. The artwork for the soundtrack was likewise pretty straightforward. The main font was “ITC Avant Garde Pro”, and the stylized “computer” font was “Bitwise”. Probably the more interesting thing was that we had to modify the key art on the cover to remove the image of “The Jetsons” on the screen that D.A.R.Y.L. is looking at, since it wasn’t something licensed for the soundtrack. You can get the soundtrack here.